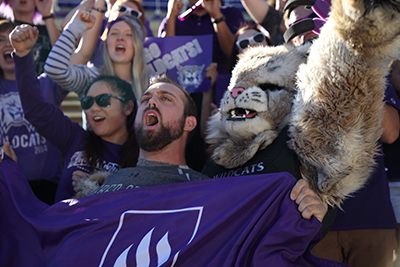 With new campus goals to increase the number of out-of-state students, the university was looking to supplement the incoming student class with a fresh approach to their already ambitious recruitment and retention plans. Weber began work with Ruffalo Noel Levitz in 2016 for strategic enrollment planning and recruitment consulting. The university initially focused on new, out-of-state markets. Through the strategic enrollment planning process, the university saw the opportunity to make a broader impactand immediately began using RNL Demand Builder for search, RNL Applicant Cultivator, RNL ForecastPlus™, RNL Advanced FinAid Solutions™, RNL TrueCost Calculator™, and RNL Digital Dialogue. 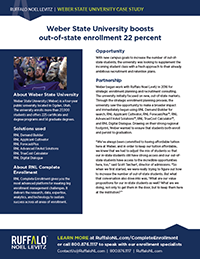 Drawing on their strong regional footprint, Weber wanted to ensure that students both enroll and persist to graduation. The university created initiatives for out-of-state students that helped campus see how the out-of-state demographics fit into the broader institutional mission and vision. The team also took a hard look at their financial aid offerings and revamped all of their scholarships. Thinking more like a private institution was also beneficial when developing initiatives. The data-centered approach to financial aid, combined with retention strategies, brought quick success for campus. According to current point-in-time analysis, a 30 percent increase in out-of-state freshman admits and a 12 percent increase forin-state freshmen. According to current point-in-time analysis, a 22 percent increase in out-of-state freshman enrollments, and an increase of 4 percent in-state. Get a personal tour of RNL Complete Enrollment, the industry’s only comprehensive solution for building your strategic roadmap and recruiting and retaining the right students. It delivers the research, data, expertise, analytics, and technology to sustain success across all areas of enrollment.